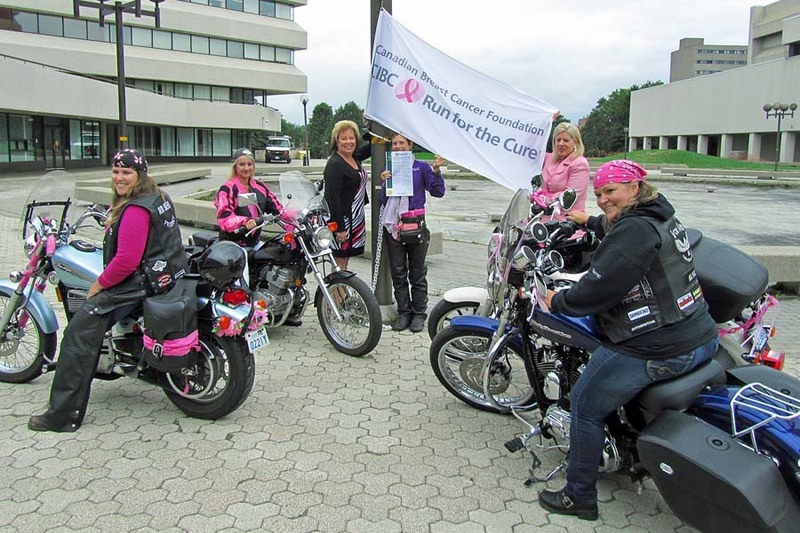 The raising of the CIBC Run for the Cure flag on Friday August 24 put the finishing touches on"Paint Canada Pink Week" in Sudbury. The Iron Sirens motorcycle club were on hand to support our survivor speaker Nicole Blais, director Stephanie Koett and mayor Marianne Matichuk in raising the flag. Mayor Matichuk also signed the proclamation for "Paint Canada Pink". Events during the week leading up to the proclamation included beach volleyball, hug a survivor, shake your pink with Zumba Vibe and the Iron Sirens Ride for the Cure. For the second year in a row Rocks!! 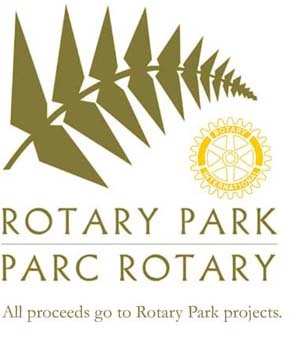 members Trevor Shamas (VALE), Lise and Vince Perdue have assisted the organizers of the Bloomington Cove Trail run. We assisted with course set up on Saturday and timed the event on Sunday. Members of the committee are VALE contractors and friends of Trev's. SudburyRocks!!! co director Sheila Yaw-MacLean presents Canadian Diabetes Association representative Chris Montgomery with a cheque for $45,000. 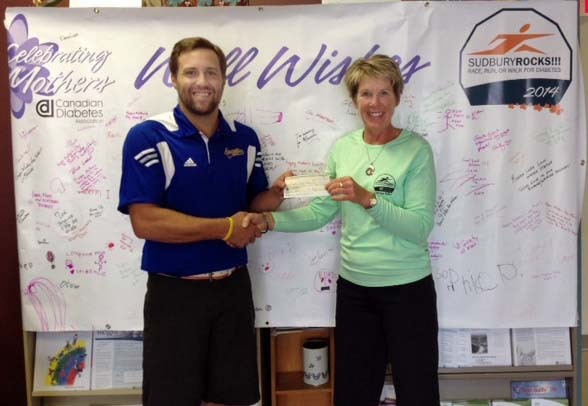 The CDA raised a further $23,000 from the May event bringing the total amount to $68,000. Although yoga and running lie on opposite ends of the exercise spectrum, the two need not be mutually exclusive. During the course of an average mile run, your foot will strike the ground 1,000 times. The force of impact on each foot is about three to four times your weight. It's not surprising, then, to hear runners complain of bad backs and knees, tight hamstrings, and sore feet. The pain most runners feel is not from the running in and of itself, but from imbalances that running causes and exacerbates. If you bring your body into balance through the practice of yoga, you can run long and hard for years to come. Although yoga and running lie on opposite ends of the exercise spectrum, the two need not be mutually exclusive. In fact, running and yoga make a good marriage of strength and flexibility. Runners who stick with running are most likely structurally balanced individuals who can handle the physical stresses of the workout with minimal discomfort. Yet, many runners don't survive the imbalances that running introduces. Often, they suffer from chronic pain and are sidelined by injury. A typical runner experiences too much pounding, tightening, and shortening of the muscles and not enough restorative, elongating, and loosening work. Without opposing movements, the body will compensate to avoid injury by working around the instability. Compensation puts stress on muscles, joints, and the entire skeletal system. If you're off balance, every step you take forces the muscles to work harder in compensation. Tight muscles get tighter and weak muscles get weaker. A tight muscle is brittle, hard, and inflexible. Because muscles act as the body's natural shock absorbers, ideally they should be soft, malleable, and supple, with some give. Brittle muscles, on the other hand, cause the joints to rub and grind, making them vulnerable to tears. Muscle rigidity occurs because runners invariably train in a "sport specific" manner—they perform specific actions over and over again and their focus is on external technique. This repetitive sports training or any specific fitness conditioning results in a structurally out of shape and excessively tight body. Yoga's internal focus centers your attention on your own body's movements rather than on an external outcome. Runners can use yoga practice to balance strength, increase range of motion, and train the body and mind. asanas move your body through gravitational dimensions while teaching you how to coordinate your breath with each subtle movement. The eventual result is that your body, mind, and breath are integrated in all actions. Through consistent and systematic asana conditioning, you can engage, strengthen, and place demands on all of your intrinsic muscle groups, which support and stabilize the skeletal system. This can offset the effects of the runner's one-dimensional workouts. In addition to physically counteracting the strains of running, yoga teaches the cultivation of body wisdom and confidence. As you develop a greater understanding of the body and how it works, you become able to listen and respond to messages the body sends you. This is especially important in running, where the body produces a lot of endorphins. These "feel good" chemicals also double as nature's painkillers, which can mask pain and the onset of injury or illness. Without developed body intuition, it's easier to ignore the body's signals. Awareness translates to daily workouts, too. You learn through the practice of yoga that each day is distinct, much like each run. Your energy levels fluctuate daily, even hourly, thus it's important to have a sense of your reserves. The calmness you glean from yoga practice allows you to manage and economize your energy. You can learn to intuit where you are on a given day and what resources you have to give. Therefore, you don't power drive through every workout mindlessly but rather respect your body's limitations. You can, however, maximize those varying energy levels by focusing on another nonkinetic aspect of yoga: relaxation. When you're able to bring your body into a state of repose, you become more effective at using and conserving strength. If you're in a contracted state—tight muscles, limited range of motion, chronic pain—your body requires more energy for all activities, running included. Relaxation allows you to burn energy at a more efficient level. The resulting increased vigor means a greater freedom of movement and ultimately, more enjoyment of all your physical activities. Tension is the athlete's downfall, and breath awareness is key to reducing it. Conscious breathing and pPranayama exercises, which soothe the sympathetic and parasympathetic nervous systems and relax the entire body, can be of great benefit to runners. Many runners know that improving VO2 Max—aerobic capacity—is vital for running and racing success. Runners with a high VO2 Max have the capacity to pump large amounts of oxygen-rich blood to working muscles. Maximum oxygen intake is a crucial physiological variable determining performance and endurance for runners. With pranayama and asana conditioning, you can maximize the size of your pump and the quantity of fresh blood coursing through your body. A somewhat vigorous yoga practice can increase your oxygen capacity. Even the most centered and relaxed runner can face injury—the bane of all athletes. Damage to a runner's body is often the result of overuse instead of collisions or falls. It all comes back to—you guessed it—balance, symmetry, and alignment. The body is the sum of its parts and impairment of one affects them all. A bad back is going to affect your ankles just as weak knees can throw off your hip alignment. For example, shin splints are the result of a seemingly minor misstep: an uneven distribution of weight that starts with the way the feet strike the ground. Each time the foot hits the pavement unevenly, a lateral torque travels up the leg, causing muscle chafing and pain up and down the tibia known as shin splints. Knee pain, too, is related to other parts of the body. If the ankles are weak or the hips are not aligned, that can put strain on the anterior ligaments in the knees. Meant to work like a train on a track, a knee thrown off balance is equivalent to a train derailing. Due to constant forward motion, hip flexor muscles shorten and tighten and can cause hyperextension in the lower back. This constantly arched position holds tension in the back and can hamper the fluidity of hamstring muscles as well. What does this mean for the runner with pain in his lower back? Or a painful heel condition? First of all, don't ignore your body's signals. Take a break when your body needs one. Learn to intuit when rest is appropriate. Secondly, start incorporating yoga postures into the warm-up and cool-down portions of your workout. Think of running as the linear part of your workout and yoga as its circular complement. There's no need to be sidelined by injuries and discomfort brought on by your running program. Chronic injuries can eventually self-correct through a gentle yet consistent yoga practice. Remember, your body is on your side. It has an inherent intelligence to bring about a state of equilibrium no matter how many times your feet hit the pavement. Baron Baptiste is a yoga teacher and athletic trainer in Cambridge, Massachusetts, known for his work with the Philadelphia Eagles and as the host of ESPN's "Cyberfit." Kathleen Finn Mendola is a health and wellness writer based in Portland, Oregon. 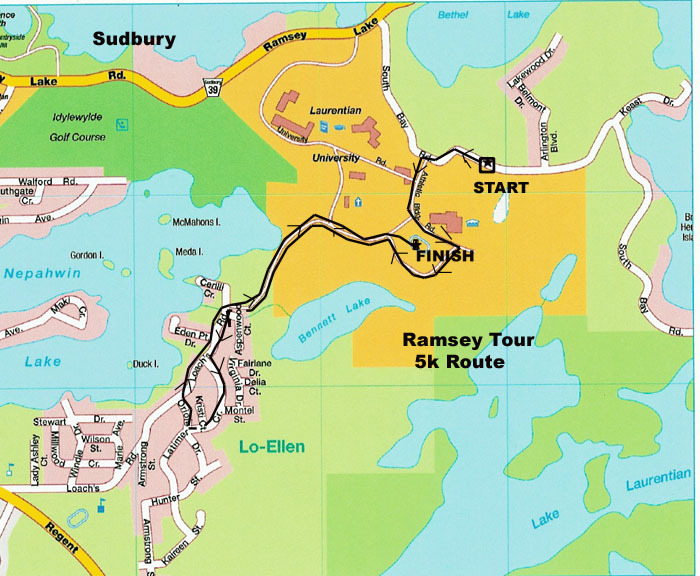 The SudburyMasters Continental Insulation Ramsey Tour is taking place on Sunday, September 7 at Laurentian University at 10:00 am. 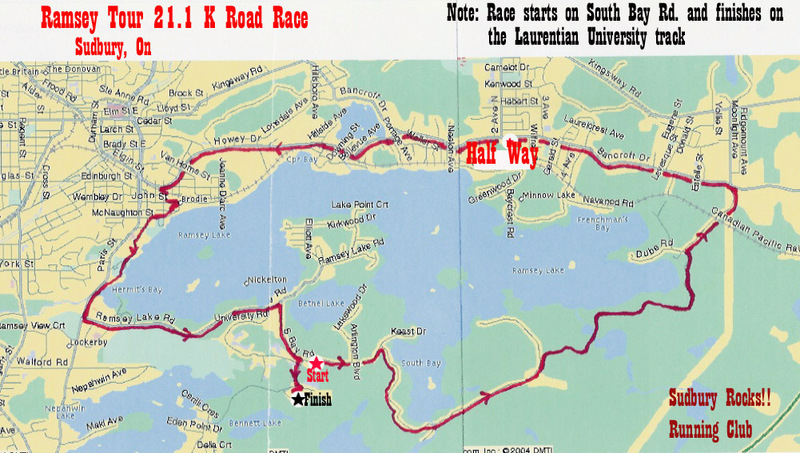 There will be both a 5 km and a 1/2 marathon. You can register on-line through the Running Room (NOW). You can register manually by downloading the entry form (HERE). We have FREE run club Wednesday nights at 6pm and Sunday mornings at 8:30am. All photos images and content copyright Sudbury Rocks! !